I’m looking for a couple of locations from the sixties spy movie Assignment K. Sorry about the picture quality of the screengrabs, as they not up to the quality of stills I usually post here. 1. 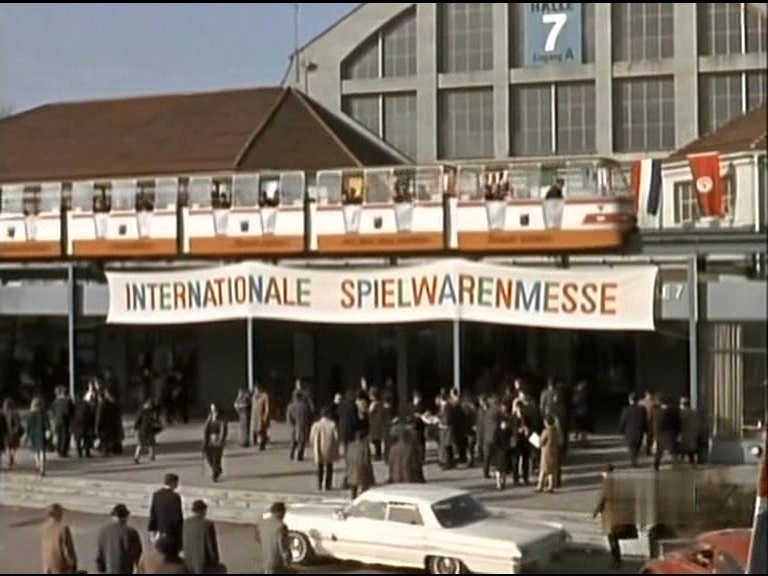 I believe this to be the International Toy Fair at Nuremberg, Germany, in 1967. Spielwarenmesse are the company who hold the fair, which has been held at the Messezentrum exhibition centre in the city since 1974. As Assignment K underwent principal photography January to May 1967, this is obviously the former venue, but I’ve not been able to confirm that or it’s actual location. I thought it would be a simple matter to researching the monorail on line, but this has proved impossible to find. Can anyone confirm where this was filmed? 2. 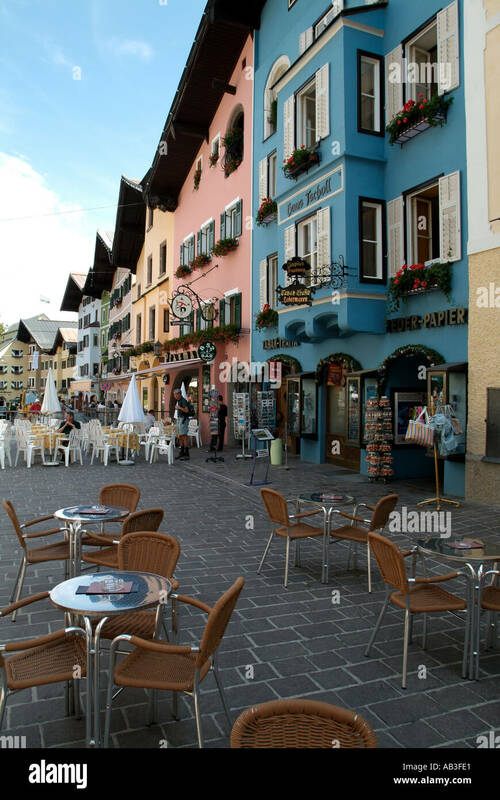 This is Kitzbuhel in Austria, but I cannot find the actual street. The two display cabinets outside the shop and the road sign informing drivers that it is 9.3 kilometres to Innsbruck, have not really helped mainly because there is no Streetview in Austria. Filming did take place on the street known as Vorderstadt, but this appears to be somewhere else in the town. As always any assistance in locating these unknown filming places will be greatly appreciated. Four screengrabs here showing Stephen Boyd as Philip Scott driving his Alfa Romeo Guiletta to the Plough Garage that used to stand at 30 Clapham Common South Side. This road does not appear to be any of the roads in the local area, unless there has been some major redevelopment since the sixties. Does any of the ace location spotters on BritMovie know where it is? Again appologies for the image quality. Although this film was in 'Scope, they seem to be 4 x 3 pan and scan images that have been stretched out wrongly to a CinemaScope shape, distorting the images. It can easily be rectified by taking the images into PaintShop pro and reducing the image horizontally by 50 per cent. The locations would look more natural then. Last edited by darrenburnfan; 30th December 2017, 12:28 PM. Thanks for the solid information and resizing the first image. Unfortunately, I do not have PaintShop pro on my laptop. When the camera turns around on this first image you see some buildings and on one of them is the lettering Hauptrestaurant, which when translated from German to English reads, Main Restaurant, so again this really does not help any, but still live inn hope that someone can trace the monorail and pinpoint the location. I think this is a bit more what the London street looked like but I still don't know where it is. Thanks for the additional images, that are not stretched like the ones I put up. I'm hoping that its only a matter of time before someone recognizes this. Well done DocRobertPepper - I had been looking much closer to Clapham Common. Exceptional... DocRobertPepper, many thanks for discovering this one, which due to the increased amount of trees and bushes, plus various alterations to the buildings cannot have been easy to locate. Last edited by Anthony McKay; 31st December 2017, 09:09 PM. A big thank you. Great detective work, yes this is Vorderstadt, in Kitzbuhel, where other footage for the film was shot further down the street. There are some individual images of the street on Streetview, but although the glass cabinets and road sign are long gone, all the coloured shop fronts are in the right place. The image on your link appears to be from some years ago. Also... I've found the other location and I'll be posting an up to date image tomorrow. Thanks for the additional information, all good solid info. I was thinking that the toy fair was held in Nuremberg, but with more research I actually found the location in Munich, a city where incidentally other filming for Assignment K took place. The fair that Philip Scott attended was organised by toy specialist Spielwarenmesse, who still hold these events, with filming taking place on location inside and in front of one of the exhibition halls on Am Bavariapark, in Munich. The monorail had originally been constructed for the international transport exhibition held there and in the adjacent Bavaria Park and large open space to the east, between June and October 1965, although it appears not to have lasted much longer than 1967 at this site. 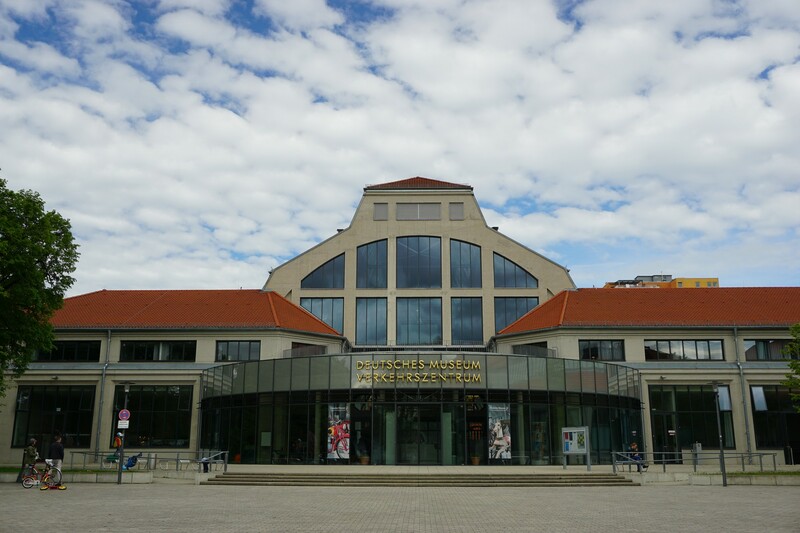 After extensive conversion work the exhibition halls here have become the Deutsches Museum Verkehrszentrum, a facility specialising in transport history that opened in May 2003. As I’m sure you’ve noticed, there has been some cosmetic changes at this location.